Where to go in La Serena? The beaches along the Avenida del Mar make up one of the busiest promenades in La Serena. The Avenida goes from the Faro Monumental (Monumental Lighthouse) to the south, as far as the adjoining beaches of Peñuelas. This avenue is 6 km long and serves 12 beaches, known as: El Faro, Los Fuertes, Mansa, Blanca, La Barca, Cuatro Esquinas, La Marina, El Pescador, El Corsario, Hipocampo, Las Gaviotas and Canto del Agua. All are suitable for swimming and water sports except for El Faro. This is where the city of San Bartolomé de La Serena was re-founded on August 26, 1549. It is the main public space of the city and in its center there is a great stone fountain sculpted by the artist Samuel Román. Located on Calle Balmaceda Nº 640 at the corner of Eduardo de La Barra, it was built between 1585 and 1627 in the Italian Renaissance style and was the first stone church in La Serena. Its construction was difficult and costly as the limestone came from Peñuelas Alto and the wood from Ovalle. It is a testament to the colonial era and was declared a National Monument in 1977. In its oldest section you will find the Museo de Arte Religioso, which is currently closed for repairs. Across from the church there is a small plaza with a pergola and a fountain that fit quite harmoniously with the church. Located on Calle Cordovez at the corner of Cienfuegos, it has a stone doorway dating from 1820, which belonged to a colonial house. The building itself dates from 1948. It has a collection of artifacts from various pre-hispanic cultures from the north of Chile, among them Diaguito pottery and a genuine moai from Easter Island. The museum has been operating since 1943. It has a valuable archaeological collection from the pre-agricultural and agricultural-pottery cultures in Atacama and Coquimbo (Molle and Diaguita). It also houses remnants of cave paintings located in the mining area of Los Pelambres, inland from Salamanca in the Provincia de Choapa, and includes a complete anthropological and historical library. It is closed all day Mondays and on Sunday afternoon. Located on Calle Cienfuegos at the corner of Cantournet, this is La Serena’s municipal market. It named La Recova since, as was the custom in colonial times, it is surrounded by arches. Here you will find the city’s best handicrafts market, as well as restaurants and patios where you can take a break. Considered to be one of the most attractive municipal markets in the country, on the first level it offers a variety of products from La Serena’s cuisine. Cakes and crystallized papayas, fruits in syrup, white manjar with nuts or lucuma, and goat’s cheese are some of the treats to tempt your palate. The building was inaugurated in 1981 and built in a modern neo-colonial style. Its main access is formed of two columns faced in stone and topped with a triangular pediment. This mineralogical museum belongs to the Universidad de La Serena, and is part of the Mining Engineering Department of the Engineering Faculty. It is located on Calle Infante, corner of Anfión Muñoz, on the Ignacio Domeyko campus. It contains about 7,000 mineral samples from various mining districts in the country and abroad. Among the more interesting pieces are the silver rosiclers from Chañarcillo, rubies from India, diamonds from Brazil and Africa, lapis lazuli from Chile, meteorites, fossils and rocks that comprise the earth’s crust, and unique gold-bearing minerals from the El Indio deposit. It is open from Monday to Friday, 09:30 to 12:30 hrs and 14:30 to 17:00 hrs. Here piscos from various locations are stored, mixed and bottled. You can take a tour of the plant and taste the products. This was the main house of the estate of the same name that contained the richest lands in the area of La Serena. Its construction was begun in 1876 in the neo-classical style. Today only the park and the house remain. Located on Calle Matta Nº 495 at the corner of Cordovez, it is a two-story adobe house built in 1890 by José Viera. It was declared a National Monument in 1981. It was built in the same sector as the house of the founder of La Serena, Francisco de Aguirre. Nowadays it houses the Museo de Historia Regional Presidente Gabriel González Videla, which was opened in 1984 and is divided into four sections: the life and works of the president, regional history, the Oscar Prager art gallery and an exhibition room. Located on Calle Matta Nº 495 at the corner of Cordovez, the museum has operated since 1984 in what was once the home of former President Gabriel González Videla. It was declared a National Monument in 1981. A special section pays homage to the former head of state who, during his presidential term (1946-1952), transformed the city center and its architecture with the ‘Plan Serena’, adopting the colonial or serenense style, a unique feature in the national context. Other sections of interest are the history section, the art gallery and the exhibition room. Open every day except Saturday afternoons and all day Sundays. The cathedral was declared a National Monument in 1981. It is located at the northeast corner of the Plaza de Armas, at the corner of Calle Cordovez. It was the first church built when La Serena was founded in 1544. After suffering damage at various times, the church as it now stands was built around 1844, following the plans of a French architect, Juan Herbage. The walls of the building are of ashlared Peñuelas limestone with lime mortar; the stone foundations are rough and undressed. The columns are of wood, stuccoed with cement mortar and ground limestone. On the ceilings, there are barrel vaults mounted with panels. The floor is of black and white marble like a chessboard. The framework of the roof is of wood; it is covered with galvanized iron. Located 5 minutes from the center of La Serena, the Avenida del Mar, whose beaches extend from the Faro Monumental (Monumental Lighthouse) to the Playa Canto del Agua on the border of Peñuelas, is the starting point of one of the city’s most attractive promenades. The city has many tourist services, such as apartment-hotels, camping sites, pubs and discos, restaurants, motels, children’s playgrounds, and modern apartment blocks. It is also possible to rent private furnished apartments for 4 to 6 people. A very long beach, which begins at Coquimbo’s Avenida Costanera and goes to join La Serena’s Avenida del Mar. Its waters are suitable for swimming and water sports. Its facilities include a casino, an equestrian club and an exhibition site, as well as a local fishing creek. Located at Cordovez Nº 235 on the corner of Matta, this single naved church was built in limestone between the 17th and 18th Centuries. It is believed that the current church, begun in 1755, used stones from the former church; for example, in the south wall you will find a stone carved with the date 1673. The church was completed in 1775. Note the beautifully uncluttered stone façade, with a large cedar door. The tower was constructed in the 19th Century and differs from the colonial style of the church. In many cities with a long history, such as La Serena, the origin of the tree-lined avenues generally indicates the line of an old branch of a river; when the river waters were channeled, the remaining part of the riverbed was turned over for public use. This is the case with what is now the Alameda Francisco de Aguirre, with the transformation, begun in 1855, of the San Francisco stream into a public road. The Alameda was remodeled as part of the Plan Serena (1946-1952), and a collection of statues was added which today makes up the ‘Museo al Aire Libre’. Located at Prat Nº 446, this adobe house was constructed in the neo-classical style by Samuel Averell in 1845 and declared a National Monument in 1981. Its façade consists of a main entrance framed by pilasters on pedestals and a lintel with frieze and cornice. The doors and windows display fine carpentry finishings. In addition, the patio is paved with huevillos, or small, round pebbles, which have been laid in geometric designs. Currently it functions as the Universidad de La Serena’s Centro de Extensión y Comunicaciones. This is a park designed for walking, in which Japanese culture is displayed through typical works of art and buildings. In the center you will find a large island in the form of a crane, a symbol of prosperity, on which there is a pavilion and a pagoda together with a ceremonial well. The wide expanses of green space, composed of grass, native trees and exotic plants, are dotted with Japanese stone objects, particularly lanterns which mark different points of interest and viewpoints. This park represents the twinning of two cities, La Serena and Tenri, which have been officially linked culturally and commercially since 1966. Visiting hours in the spring and summer are every day from 10:00 to 20:00 hrs and in the fall and winter Tuesdays through Sundays from 10:00 to 18:00 hrs. Access to the park is via Avenida Juan Bohón and Avenida Pedro Pablo Muñoz. It is a municipal park, offering facilities for sports and family recreation. It is possible to practice such sports as football, rugby, athletics, basketball, etc. There is also a children’s playground, walking trails and a small zoo. Admission is free and the park is open Tuesday through Sunday from 09:00 to 18:00 hrs. Located at Calle Balmaceda Nº 390, this historic stone church dates from 1709. Its gothic-style facade and tower are the work of D. Roberto Parker. Located at Calle Cienfuegos 402 on the corner of Cantournet, it was founded in 1672 and rebuilt in stone in 1755 in the form of a Greek cross. Today you can see the results of an exemplary restoration, begun in 1986. This was declared a Zona Típica (Typical Area) in 1981. It is a natural viewpoint, sited on one of the terraces on which the city is built. 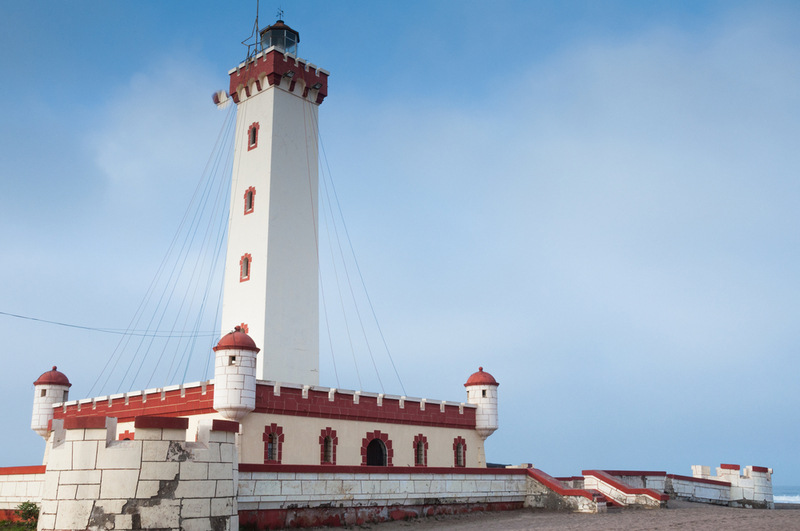 From here you get a fine view of the Bahía de Coquimbo and can appreciate the architecture typical of La Serena. The main access to La Serena, distinguished by its marble sculptures and the Plaza de los Poetas. Located on Calle Cisternas at the corner of Amunátegui, the hill forms a natural viewpoint with an excellent view of La Serena and the Bahía de Coquimbo. It has been the center of university student life for decades. This lighthouse was erected at the western end of Avenida Francisco de Aguirre and next to the sea, at the inception of the Plan Serena. It is an ideal place to enjoy a beautiful sunset. This chapel is located on Calle Matta at the corner of Almagro. It was declared a National Monument in 1977. It is one of the oldest churches in La Serena, constructed in adobe in 1819 on the site of a 17th Century chapel. It has been closed since 1975 and a restoration study is being carried out. Located on Calle Cantournet at the corner of Justo Donoso, it was declared a National Monument in 1981. It is a remarkable example of the neo-classical architecture of the 1890s. Its finely finished chapel still has the original altars. This neo-classical house is located at Balmaceda Nº 1080. It was declared a National Monument in 1981. It is remarkable for the long façade on the south side, the ample mirador and for the quality of the work on its main front. Located at Calle Matta Nº 331, it was declared a National Monument in 1981. It was built in the middle of the 19th Century in the neo-classical style. The original frame, decorated with a small series of arches in the middle similar to a scallop shell, is worthy of note. Located at Calle Los Carreras Nº 271, the house was declared a National Monument in 1981. It is an important neo-classical residence built in 1868. The façades decorated with wooden pilasters and grilled windows are worthy of note; the second floor has iron doors, windows and balconies. The cemetery is located on Calle General Novoa (no number) in La Serena. It is part of La Serena’s and indeed Chile’s cultural heritage because it is here that former Presidente de la República, Gabriel González Videla and, among others, is buried. Visiting hours are Mondays through Fridays 08:00 to 13:00 hrs. and 14:30 to 18:00 hrs and Saturdays from 08:00 to 13:00 hrs.